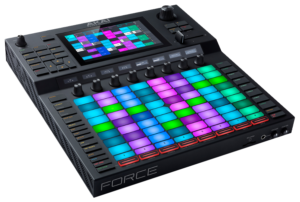 The Force firmware update v3.0.2 brings Splice integration and browser audition warp and sync to your fingertips. In this article, we'll show where to find the latest update, how to install it, and how to explore the new features. The new Force 3.0.2 firmware update adds a new line of comprehensive features as well as a few stability enhancements. See our quick list below or view the official release notes for a full list of changes. Splice Integration - Splice fuels the creativity of producers around the world with millions of high-quality, royalty-free samples, presets and loops, covering nearly every musical style.You can now download and browse your Splice sample library on your Force standalone. Browser Audition Warp and Sync - In the Browser you can now audition samples/loops that have a Force-embedded tempo in sync with your project tempo. See a complete list of release notes here and the video below for a full overview. To download the Force 3.0.2 Firmware Update, visit the Force product page at akaipro.com and click on the Downloads tab. Update installers are available for Mac and Windows, as well as a file for updating via USB Flash Drive. Download your preferred installer type and follow the instructions in the next section for any assistance installing. When you're ready to install, follow the video below for a complete walkthrough of the computer and USB update process.